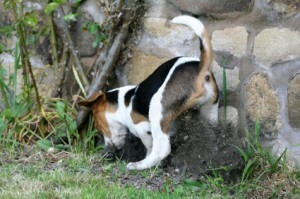 Digging problem with your dog? Try these tips. One way to make digging holes in your backyard less rewarding for your dog is to place stones, not big rocks, in the holes and cover the stones, up. When the dog tries to dig, he will encounter the stones and stop digging. Another trick, although somewhat less attractive, is to place your dog’s waste into the hole. They won’t dig where they can smell dog poop. Another trick, any my personal favorite, is to put a sandbox in the back yard that is just for the dog. Place the dog’s toys and other favorite items in the sandbox and let thim bury those things in the sandbox. Praise for the digging and burying in the sandbox. The dog will soon realize it’s ok to dig there and not in the yard. I like this one because it manages the behavior, it is totally non-aversive and everyone ends up happy!